This is the first of a series of drawing tutorials in which I’ll add an assortment of inanimate objects to each hand pose. I decided to introduce inanimate objects because in my kind of right-brained drawing technique, there’s actually no difference between sketching a hand or sketching anything else (as long as you’re drawing some kind of model). This is part two of tutorial #9. The first part is here. 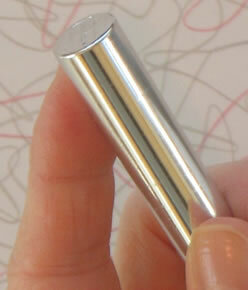 The end of that post describes the type of object you’ll need for this lesson. See the relevant sections of this post for what you’ll need and how to arrange your space. 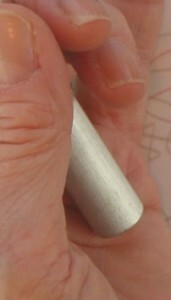 Then hold your object in your non-drawing hand in a position as close to the one I’ve used as you can. As always in my tutorials, you don’t have to be exact because I’m teaching a general drawing method, not how to draw specific poses. As you watch the video at the end of this post, notice that I didn’t treat the bottle opener as something different from the hand. I didn’t draw the hand first and the opener second or vice versa. I drew the opener as I went along, interspersed with drawing parts of the hand. The opener and the hand were both pieces of the whole jigsaw puzzle of shapes I was assembling. You should try the same approach as you draw your own hand. You can either follow a similar sequence in choosing shapes to sketch as I did, or choose a different sequence. You should move ahead sketching shapes that you notice or that make sense to you in relation to other pieces of your puzzle. Remember that your jigsaw pieces need to fit into each other and into the whole. The first line I made for the bottle opener happened in Frame 4, when I noticed that its black handle ran roughly parallel and close to a vertical line I had drawn in Frame 3 to help me locate the correct place for the bottom of the wrist. I then drew a few more lines for the handle, but I didn’t complete the top of the bottle opener till later (beginning in Frame 15). Instead, I moved to where my fingers held the handle. 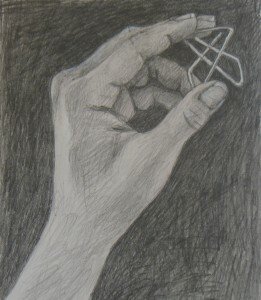 I drew the juncture between the lines of my fingers and those of the handle. 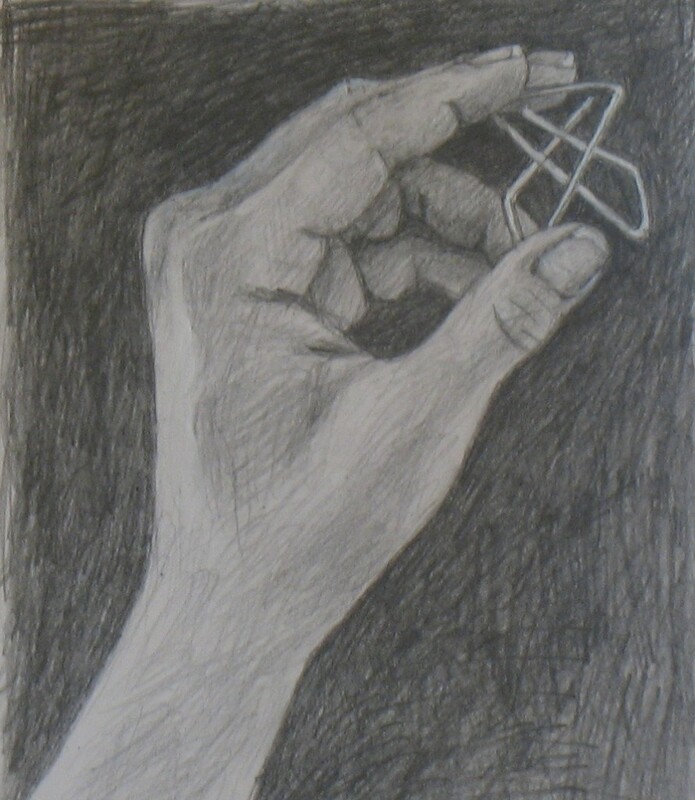 Draw the first few lines depicting your hand to one side of your object. Then focus your right-brain seeing to observe where some of the lines of your object are in relation to the hand-shapes you’ve already sketched in. Draw them; then move on to shapes that intersect them, whether part of your hand or your object. 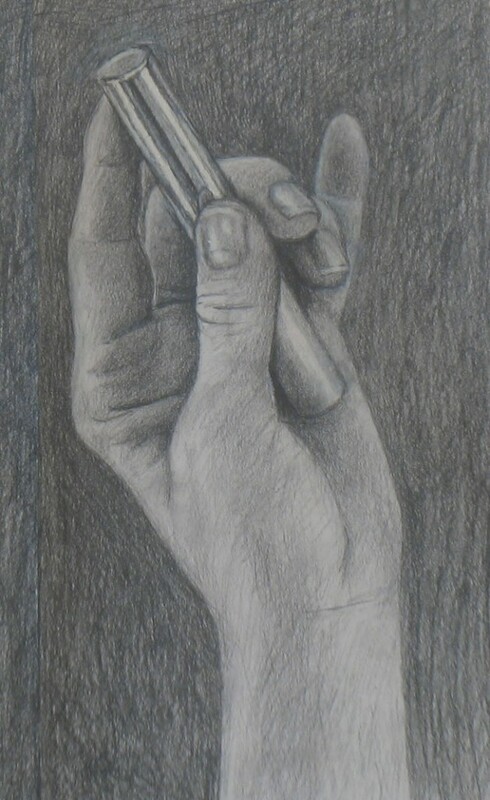 My shading of the opener (beginning in Frame 30) was also interspersed with shading the hand. The shapes of the opener’s light and dark areas were jigsaw pieces that fit into the light and dark bits of the hand. 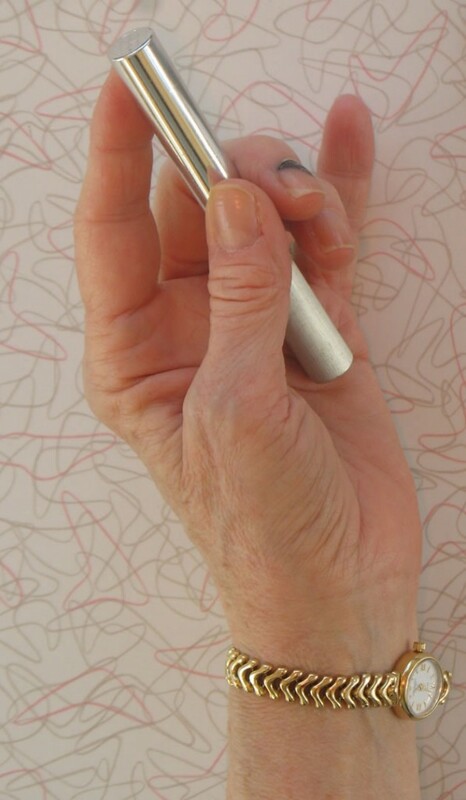 The most helpful shape in this hand pose is the dark space between thumb and fingertips, where the opener handle rests in the palm. It’s the very center of the drawing. I used this space repeatedly, beginning in Frame 11, to measure and judge what I was drawing all around it. I used the darkness of its shading as a benchmark for all the other tones. Your drawing is likely to have a similar dark space where your fingertips meet your thumb/palm. Focus on drawing and shading this space accurately, and it will help you draw everything around it. You may want to do one run-through of the video below focusing just on the changes in form and shading of this “negative space” between my fingertips and palm, as they evolved in during the course of my drawing. Sometimes the hardest thing about adding an object to a hand drawing is the fact that the object interrupts the the jigsaw hand pieces you’re used to fitting together into a single whole. It happened to me in this drawing. 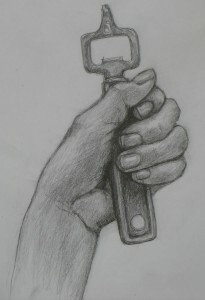 I had a lot of difficulty accurately assessing the shapes of the fingers and palm around the bottle opener. So a lot of this video is taken up not with sketching the opener, which was simple, but with endless revisions of parts of the hand. This drawing was like the proverbial sausage, not pretty in the making. But as always, I recommend forging ahead. The more you practice, the better your drawing ability will become. Note: The lightened image Frames 42-45, and the sudden darkening beginning Frame 47, are accidental lighting artifacts. They were not part of my drawing process.